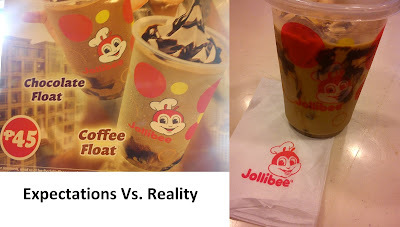 A close friend and a fellow workmate mentioned that Jollibee now sells Coffee Float. Yes, I was skeptic thinking that she meant the Coke Float. It sure was the caffeine kind when I saw the posters. It got me thinking, would it be weird to have ice cream on your coffee? I was never a fan of coffee for I always end up with palpitations. I try to steer clear from it and make sure that I do not ingest anything remotely caffeinated. Last Monday, we headed to Colon because it has been awhile since I last roam the oldest street of Cebu. This is where you can get the latest thrifted finds, knock off shades and anything else imitation. Also a go-to place for local delicacies and those of the exotic kind. We have the Sa-ang or boiled meat of a conch shell, fried chicken and even kwek-kwek. I also need to check the latest sale in Metro Colon which is our local department store. After a few hours of window shopping and still finding the sandal I wanted to buy come payday, we decided to head out. My companion wanted to try the latest Jollibee product and so we went over to check if they had any. The price was sort of worth it. The iced coffee at Dunkin Donuts costs Php35 a glass, so I guess it was reasonable that a topping of vanilla icecream would cost Php10. Going to the presentation, based on the photo above you will know that they failed at that area. I am not sure if this is due to the fact that it was rush hour or they just like to do it sloppy. It would be nice to have better looking food, as they say you eat first with your eyes. Heading on to the taste, I believe you need to mix the ice cream with the drink. Ha! :P The taste was ordinary, just like how it should be. Maybe mixing it would create a big difference. I just felt it was nothing special.